Project Director SRP (PDMA Component) Syed Salman Shah Chaired an important meeting on upcoming disaster response teams for 6 divisions of Sindh. A team of consultants from National Support Organization, Islamabad briefed the participants about the proposals. Provincial Disaster Management Authority has deputed Director(operations) at Jaffar Tayyar Society in Malir to carry out and supervise relief operations, PDMA Sindh has also coordinated with KMC Urban Search and Rescue team and focus rescue team of Aga Khan foundation for an organized rescue effort. All necessary equipments including manual cutters and gas cutters have been sent to the site. The 13th Board meeting of Provincial Disaster Management Authority (PDMA) Sindh was held under the chairmanship of Mr. Muhammad Hussain Syed, SMBR Sindh at PDMA Head Office Karachi. First Meeting of Working Group for Coordination Between Government Departments and Management of UN Organizations regarding Drought Affected Areas of Sindh was held at PDMA Head Office. Meeting with Representatives of UN Agencies to discuss road map for drought mitigation in Sindh. Meeting with Mr. Thatree Chauvachata, the Royal Thai Consul General in Karachi to pay a Courtesy Call on the Worthy DG PDMA Sindh. Meeting with Natural Disaster Consortium (NDC) regarding drought affected areas of Sindh was held at PDMA Head Office Karachi. Visit of Chinese Delegation under the Leadership of Mr. HE LIANGHUI, Vice-Governor, The People’s Government of Yunnan Province, China at PDMA Head office Karachi. PDMA Sindh organized National Disaster Resilience Day at DABeach View Park near Sea View, Karachi. The day is celebrated in commemoration of Earthquake 2005 victims. The Advisor to Chief Minister Sindh for Information and Archives, Law, Enquiries and Anticorruption Department, Barrister Murtaza Wahab graced the occasion as Chief Guest and highlighted the importance of awareness for Disaster Resilience. The Secretary Rehabilitation/DG PDMA, Mr. Akhtar Hussain Bugti, other high officials from Government of Sindh and a number of representatives of civil society, NGOs, electronic and print media participated in the event. 5th Program Management Committee (PMC) Meeting of ‘Building Disaster Resilience Project’ was held under the Chairmanship of Secretary Rehabilitation / Director General PDMA Sindh at PDMA Head Office Karachi. Care taker Minister Rehabilitation, Mr. Col (Rtd.) Dost Muhammad Chandio visited Provincial Disaster Management Authority Sindh (Headquarter) Karachi. PDMAs Preparedness & Contingency Planning Conference for Monsoon Season-2018 was held under the Chairmanship of Chairman P&D Board in the Committee Room, 7th Floor, New Sindh Secretariat Building No.1 Karachi. Meeting on ‘Building Disaster Resilience Project’ was held under the Chairmanship of Secretary Rehabilitation / Director General PDMA Sindh at PDMA Head Office Karachi. Meeting Regarding Sindh Emergency Rescue Service 1122 was held under the Chairmanship of Secretary Rehabilitation / Director General PDMA Sindh at PDMA Head Office Karachi. The Meeting of Departmental Accounts Committee (DAC) was held at PDMA head office under the Chairmanship of Secretary Rehabilitation / Director General PDMA Sindh along with Director General, Directorate General Audit Disaster Management Islamabad and other officers of PDMA Sindh. The 12th Board meeting of Provincial Disaster Management Authority(PDMA) Sindh was held under the chairmanship of Mir Mumtaz Hussain Jakhrani, Minister for Rehabilitation, Government of Sindh in the Head Office of PDMA Sindh. Balloting for allotment of houses in Turkish Housing Scheme Thatta was held under the supervision of the Honourable District and Sessions Judge, Thatta at Sports Complex Turkish Housing Scheme, Thatta. Minister Rehabilitation Department along with DG PDMA and Concerned Deputy Commissioner visited rain affected areas of karachi and provided support to other stakeholders, KMC, DMCs & District Council so as to provide Relief & Rehabilitate the Rain affected peoples urgently. Meeting regarding Preparations for Expected Rains was held under the chairmanship of Mir Mumtaz Hussain Jakhrani, Minister for Rehabilitation Department Government of Sindh in the Head Office of PDMA Sindh. DG PDMA Syed Salman Shah handing over flood fighting equipments to Brg. Asim of Engineering 5 Corps at PDMA warehouse Jamshoro. Meeting on ‘Technical Feasibility Report’ For Establishment of Sindh Emergency Rescue Service 1122 Karachi Held on 26th July,2017 at PDMA Head Office. The meeting regarding contingency plan of Irrigation Department for Monsoon 2017 and the condition of River Banks in the province was held in the Head Office of PDMA Sindh, under the chairmanship of Minister for Rehabilitation/Chairman PDMA, Mir Mumtaz Hussain Jakhrani. The Chairman Sindh Zakat Council, Justice (Rtd.) Zahid Qurban Alvi, DG PDMA Sindh Syed Salman Shah, Special Secretary Irrigation Mr. Ahmed Junaid Memon, MD SIDA Mr. Muhammad Khan Nizamani, Chief Engineers of Irrigation Department and other concerned officers attended the meeting. The 11th Board meeting of Provincial Disaster Management Authority(PDMA) Sindh was held under the chairmanship of Mir Mumtaz Hussain Jakhrani, Minister for Rehabilitation, Government of Sindh in the Head Office of PDMA Sindh, Karachi to finalize Monsoon Contingency Plan 2017. The meeting was attended by Chairman Zakat & Ushr Department and representatives of Finance, Health, Local Government and Irrigation Departments. The Chairman National Disaster Management Authority (NDMA) Lieutenant General Omar Mahmood Hayat, HI(M) visited the office of Provincial Disaster Management Authority (PDMA) Sindh on 18th May, 2017. He was joined by Mr. Mir Mumtaz Hussain Jakhrani, Minister Rehabilitation Department, Government of Sindh Karachi. Meeting on ‘Technical Feasibility Report’ For Establishment of Sindh Emergency Rescue Service 1122 Karachi Held on 20th April,2017 at PDMA Head Office under the Chairmanship of Secretary Rehabilitation Department. Meeting on ‘Technical Feasibility Report’ For Establishment of Sindh Emergency Rescue Service 1122 Karachi Held on 18th April,2017 at PDMA Head Office Karachi. Meeting on ‘Technical Feasibility Report’ For Establishment of Sindh Emergency Rescue Service 1122 Karachi Held on 22nd March,2017 at PDMA Head Office Karachi. PDMA Sindh organized a conference on Monsoon and Heat Wave Preparedness / Contingency Planning for 2017 held on 17th March, 2017 at Mehran Hotel Karachi. Director (F&A) PDMA Sindh along with Chairman National Disaster Management Authority (NDMA) and Director (Operations) PDMA Punjab attended “National Industrial Disaster Mock Exercise” held on 16th March, 2017 at FFC Rahim Yar Khan. Mr.Mumtaz Jakhrani, Minister Rehabilitation Department attended initial briefing of Department at Provincial Disaster Management Authority (PDMA) Head office. Multi-Stakeholders Consultative Meeting on ‘Technical Feasibility Report’ For Establishment of Sindh Emergency Rescue Service 1122 Phase-I Karachi Held at PDMA Head Office. A Meeting was held on 1st February, 2017 under the Chairmanship of Worthy Chairman National Disaster Management Authority in the office of PDMA Karachi to rationalize the demand of flood fighting equipments by HQ 5 Corps. Coordination Meeting Between SI Global Solutions (Pvt.) Ltd and ECIL (Pvt.) Ltd was held on 7th November, 2016 at PDMA Head Office Regarding Sharing of Information on Safe City Project & Rescue 1122. The high level meeting regarding monsoon preparedness was held at PDMA Head office which was chaired by Major General Asghar Nawaz, Chairman NDMA. Director General PDMA Sindh, Syed Salman Shah briefed the Chairman NDMA about the preparations and measures taken so far regarding monsoon preparations. The Chairman NDMA highlighted the critical aspects of upcoming monsoon season and likely effects of changing weather pattern. In pursuance of Thar Commission’s report a follow up meeting was held in the Committee Room, 7 th floor, Sindh Secretariat, Karachi on 1 st June 2016, to review and brainstorm on the recommendations of the Commission. The meeting was attended by the administrative Secretaries of the relevant Departments and during the meeting all recommendations of the report of each department were discussed at length. Thereafter, the Worthy Chief Secretary, Sindh issued directives to all the concerned stake holders to take urgent steps, and submit proposals for long term solution of crisis of Tharparkar. The 9th meeting of the PDMA Board was held in the Head Office of PDMA on 27th May, 2016. Mr. Ali Hassan Hingorjo, the Minister Rehabilitation Sindh chaired the meeting while other members, including the Chairman Sindh Zakat Council, Secretary Rehabilitation and the representatives of provincial secretaries. The 8th meeting of the PDMA Board was held in the Headquarter of the PDMA on 21st October 2015. Mr. Ali Hasan Hingorjo, the Minister Rehabilitation Sindh chaired the meeting while other members, including the provincial secretaries, were in attendance. The DG PDMA Sindh, Syed Salman Shah, started the proceedings by briefing the Board members regarding the agenda items and the crucial plans under consideration. Thereafter, an elaborate Agenda came under consideration and decisions were taken on the agenda items in the larger public interest. The Board reviewed and expressed satisfaction over the progress of implementation of the rescue-1122 project. It was hoped that the project, when implemented, will lay the foundation of a rescue and relief operation which was so direly needed for the metropolitan population in the face of emergencies that keep surfacing off and on. The Minister Rehabilitation advised the Director General PDMA Sindh to keep him regularly informed on the progress of implementation of the decisions of the Board with regard to today’s meeting. 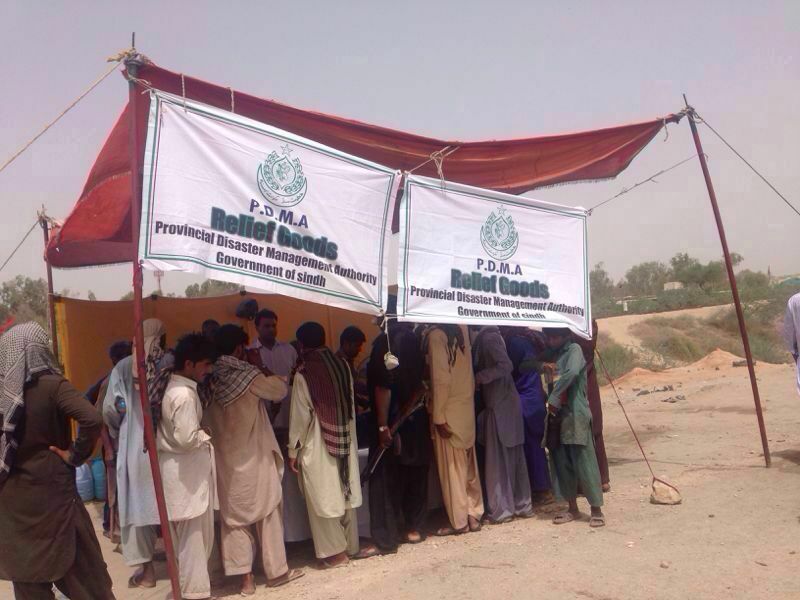 PDMA camp office established at Sukkur. In the wake of the current Monsoon 2015, Minister for Rehabilitation Department Government of Sindh Mr. Ali Hassan Hingojo along with Director General PDMA, Sindh Syed Salman Shah have camped themselves in Sukkur for personal vigil and effective governance and service delivery. They had visited the areas being affected at present, including Qadirpur Loop bund and the Tents Relief Camp at District Ghotki to monitor the situation on ground. They presided over an on-the-spot briefing from the officers concerned at Guddu Berrage. Travelling further down, they visited District Kashmore @ Khandkot and presided over a Meeting with Deputy Commissioner Kashmore and the other concerned district officers. Mr Ali Hassan Hingorjo advised the district officers present in the meeting to take all precautionary measures to reduce the impact of current Flood situation. They also visited the Begari bund at Sukkur in the wake of public complaints regarding seepage from the said bund. The Minister advised the officers of Irrigation department to keep more vigil and to plug any leakages immediately. They also gave a briefing to local media at the Zero Point regarding efforts being taken by the government departments to keep things well under control. The Director General PDMA also informed the media that so far none of the affectees had reported or brought in to the tent camps. The few people who had shifted in anticipation of the situation had gone to their relatives in the close vicinity. However, all arrangements were in place in the said tent camps. 1) DDMAs/Deputy Commissioners have been requested to establish Tent Relief Camps at high raised platform along with all basic facilities of Health and Livestock. 2) To ensure the safe evacuation of the flood affectess from kacha areia. 3) Moreover, PDMA Sindh has already provided flood relief equipments to riverine Districts to cope with any untoward situation in the area. Minister Rehabilitation Mr. Ali Hasan Hingorjo visited on ground situation. Minister Rehabilitation Department Mr. Ali Hasan Hingorjo Government of Sindh visited Civi l Hospital and Jinnah Post Graduate Medical Center, Karachi along with the Secretary Rehabilitation Department Mr. Saeed Ahmed Awan and Director (Operations), PDMA Sindh Mr/ Nazar Muhammad Bozdar to view the on ground situation and monitor the medical services being provided to the Heat Stroke patients. And meet with patients. Mr. Ali Hasan Hingorjo met with the heat stroke patients and asked the hospital administration about the medical services given to the patients. MS Civil Hospital & incharge Emergency JPMC briefed the delegation regarding the current situation to Minister. Mr. Ali Hasan Hingorjo briefed the press that Sindh government is taking every possible step for the treatment of the heat stroke affectees and he further stated that on the advice of Government of Sindh PDMA Sindh is in close coordination with all the relevant stake holders /departments, and also announced that PDMA Sindh will provide whatever is needed support for heat stroke affectees. Chief Secretary Sindh Mr. Muhammad Siddique Memon reviewed the upcoming monsoon intensity and stressing upon preparedness of divisional & district stakeholders of Sindh and also the NDMA. The Chairman NDMA Maj. General Asghar Nawaz appreciated that Sindh had displayed a remarkable enhancement in capacity building of all stakeholders. He further assured NDMA’s cooperation to Sindh as and when needed. The Director General, PDMA Sindh Commander (R) Syed Salman Shah, briefed the forum on preparedness and stated that a particular feature of preparedness and preemption was the periodic advisories which the PDMA had been sending to concerned departments and authorities. He also stated that deficiencies of required stock, if any, shall be procured and positioned at regional hubs of PDMA for immediate disaster-response. While stressing upon utmost vigilance at Vulnerable Bunds, he also requested NDMA to optimally assist the Engineering Corps 5 during monsoon-2015. The Commissioner Karachi, Shoaib Ahmad Siddiqui, informed that the KMC, DMCs and Cantonments had been duly sensitized and they will ensure timely drainage of rainwater. The Commissioner, Hyderabad asked PDMA to depute additional officers in each district with specialized tasks for camp managements. Commissioner Mirpurkhas apprised that Dhoras and LBOD have been de-silted but excessive rain over 300mm can create problems along Dhoro Poran. Administrator, KMC stated that there were issues at Pitcher Nullah, Gujjar Nallah and Kalri Nallah, but still all measures shall be taken for timely drainage of rainwater. Representative of Engineering Corps 5 appreciated the efforts of PDMA taken towards monsoon preparedness and proposed some measures to strengthen the preparedness. The representative of Pakistan Navy endorsed the views of Pakistan Army. The Chairman NDMA proposed a plan to use SMS alert as Corporate Social Responsibility of cellular companies. The Chief Secretary Sindh directed to ensure compliance of various decisions arrived at in the meeting. He advised the Director General, PDMA to coordinate with Pakistan Navy and Pakistan Army for their needs. He also advised Sindh administration to utilize services of available 150,000 boy scouts during monsoon. Monsoon Contingency Planning Meeting with Shaheed Benazirabad Division administration officers was held at Shaheed Benazirabad to review monsoon preparedness status. In continuation of the series of 'preparedness' meetings conducted by the PDMA Sindh for Monsoon 2015 with each Divisional administration of Sindh, the Special Assistant to Chief Minister Sindh (Minister Status) Mr. Ali Hassan Hingorjo along with Director General PDMA Sindh Commander (R) Syed Salman Shah held a meeting with Shaheed benazirabad Division to assess the preparations made by relevant districts for Monsoon 2015. The Director General PDMA Sindh specifically advised all the districts to give top priority to the task of de-silting / cleaning of Nallas in urban areas, the machinery available with districts and line departments must be listed and made available to the PDMA. The district administrations must also ensure to keep such machinery and equipment in full working condition. They must take all necessary steps that ensure to keep flood protection bunds fully intact within their districts; the sites for relief camps and tent cities must be established in line with the rationale and the guidelines provided in the booklet titled ,‘camp management toolkit’. The districts were advised to seek assistance of the trained personnel trained by the IOM for camp coordination & camp management. The Director General PDMA also informed that the requirement of the districts on account of relief goods and equipment would be met by PDMA as per the need. Monsoon Contingency Planning Meeting with Hyderabad Division held at Hyderabad to review monsoon preparedness status. 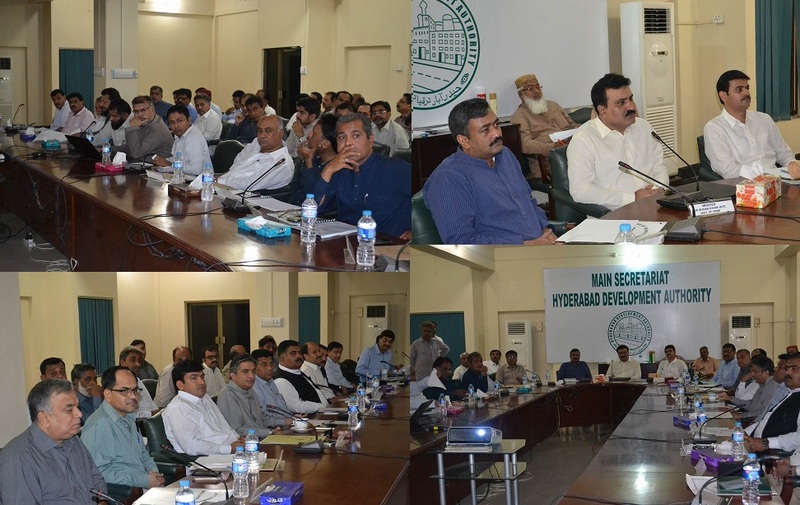 Special Assistant to Chief Minister Sindh, (Minister Status)Mr. Ali Hassan Hingorjo, Director General PDMA Sindh Commander (R) Syed Salman Shah, Mr. Nisar Hussain Channar, Dy Director PDMA Sindh along-with Hyderabad Division Districts reviewed the preparations made by the District for Monsoon 2015. All districts were advised to identify and plugin vulnerabilities of their district, plan for de-silting/cleaning of Nullas in urban areas be carried before onset of monsoon rains. Machinery available with respective districts and line department must be operative and in ready condition. Status of relief goods held by districts (if any) be shared with PDMA Sindh, condition of flood protection bunds within the districts jurisdiction be ensured by irrigation department. Sites for establishing relief camps and tent cities be identified by districts to accommodate IDPs in case of evacuation. The requirement of the district on account of relief goods/equipment would be met judiciously by PDMA and further resources with Sindh Government would be tapped to meet the requirements as per their districts need. Met Office informed that thunderstorm rain (snowfall over the hills) with occasional hail storm is expected at scattered places in lower parts of the country (Makran, Kalat, Karachi, Hyderabad and Mirpurkhas divisions) from Saturday (night) to Monday (morning) while in upper parts of the country including Islamabad (Rawalpindi, Sargodha, Faisalabad, Sahiwal, Gujranwala, Lahore, Malakand, Mardan and Hazara divisions), upper FATA (Bajaur, Mohmand, Kurram, Orakzai & Khyber agencies), GB and Kashmir from Sunday (night) to Tuesday. Sindh Humanitarian Coordination Meeting (SHCM) held at PDMA Office Karachi on 26th November 2014, to analyse drought situation in Sindh, Prospective of government and humanitarians and Response to drought situation by the government and Humanitarians. Meeting with NHA regarding identification of breaching points and construction of culverts at Lyari Express way. PDMA Sindh convened a meeting with National High Way Authority officers and Project Director Lyari Express Way on 21st October 2014 to resolve the issue of identification of breaching points at N-65 Dera Murad Jamali and construction of culverts at Lyari Express way. These issues were raised in Post Monsoon 2013 Conference at GHQ and at NDMA. NHA representative informed the Director General PDMA that by pass at N-65 at Dera Murad Jamali have been completed and culverts are already functional across the length of Lyari Express way. The Director General PDMA, Syed Salman Shah while speaking to media informed that as per the Hydrological situations the flood warnings of high to very high were issued to the districts of Ghotki, Kashmore, Larkana, Shikarpur, Sukkur and Khairpur with the directions to evacuate the peoples from Katch areas. The DG PDMA further informed that he along with Director (Finance & Admin) and officers is present in the flood prone areas of Guddu and Sukkur barrages and established the camp office at Sukkur. Director General, PDMA today visited Sukkur, Ali Wahan Bund along with the Deputy Commissioner, Sukkur. Then after DG PDMA left for District Khairpur where he visited Ulra Jagir Bund at Zero Point and Jabar Shank Bund along with Deputy Commissioner Khairpur where the works of the bunds were reviewed. Yesterday the DG PDMA along with the Commissioner, Larkana visited Nusrat Loop Bund and Shahani Bund at Larkana district. In district Kashmore they visited new/old Tori Bund and Guddu Barrage and showed satisfaction on the rehabilitation works carried out on the scheme. Besides this the DG PDMA visited Qadirpur Loop Bund and Shank Bund in Ghotki. At the same time, relief efforts are underway for the people have been evacuated from Katch areas. In the wake of incident on Eid-ul-Fitr in which 38 people lost their lives. The beach safety measures reviewed by the committee chaired by the Director General PDMA Sindh. 762nd Urs of Hazrat Lal Shahbaz Qalandar is being celebrated at Sehwan Sharif, Sindh. Taking into account the harsh climate and scorching heat, the PDMA Sindh has deployed a team at Sehwan Sharif and established a camp to serve cold water and drinks (Sharbat) to the participants and ensure availability of drinking water and ice to facilitate the participants of Urs celebrations. Required medicines for the hospitals in close surroundings of Sehwan Sharif has also been made available at the camp and PDMA Sindh is in close coordination with the District Administration, the hospitals and the organizers of the Urs celebration to provide any kind of assistance to them . PDMA Sindh organized a One-Day Monsoon 2014 Consultative Conference to evaluate the state of preparedness and finalize a strategy aimed at minimizing losses with adequate preparedness and response measures in place. Addressing to the participants of “Monsoon 2014 Consultative Conference”, organized by Provincial Disaster Management Authority at a local hotel on Wednesday, the Chief Minister Sindh Syed Qaim Ali Shah urged that on the issue of disaster management, the concerned departments should complete their preparations for the monsoon season in order to avoid flood situations of 2010 and 2011. He urged people to join hands with Sindh government for rescue and rehabilitation of flood affectees. He said that the province had faced massive flooding in 2010 which affected almost 7 million people while after floods in 2011, the province had to look after 9 million displaced people. Minister for Rehabilitation Makhdoom Jameeluz Zaman said that provincial government was taking steps to avoid floods in 2014. “On the direction of PPP Co-Chairman Asif Zardari, Sindh government will bring legislation to remove zamindari bunds, which were a major cause of floods during last several years.” He also asked the chief minister to form relief committees at district level to carry out relief activities in case of any flood. Chief Secretary Sindh Mr. Sajjad Saleem Hotiana also addressed the participants and urged all departments to coordinate with each other to devise a joint strategy to counter the situation before and after floods. He said that the Sindh government had already released funds to PDMA for relief activities, which would be sufficient to provide immediate relief to 50,000 families for upto early recovery phase. The District Disaster Management Authority (DDMA) committees were formed in each district, which would be headed by deputy commissioners. “All goods at relief centres will be at the disposal of deputy commissioners after flood, who would be able to carry out relief activities in their concerned areas,” he said. The representative of Commissioner Karachi said that there were 3 river beds, thirteen big nullahs and 250 small drainage lines in the metropolis, which was insufficient to face heavy rains and urban floods. He said that in terms of long-term planning to resolve the issue, a mega drainage system was planned by the city authorities, however, removal of encroachments, imposition of ban on dumping wastage in nullahs and other several steps were taken to avoid flooding in the city. A control room would be established at Commissioner office, where representatives of Karachi Water and Sewerage Board, K-Electric and Sindh Building Control Authority would address any complaints in the city. Other commissioners from Hyderabad, Sukkur, Larkana and Mirpurkhas also briefed the participants regarding measures taken by them for relief activities and material available and required by them for the rescue operation. 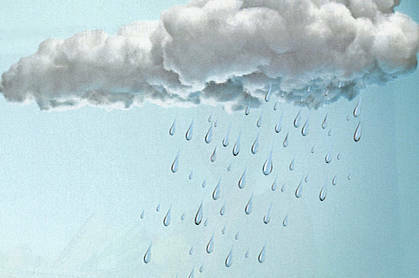 The Pakistan Meteorological department officials said that there were chances of heavy rainfall in Sindh, however it would be 30 percent less than the previous year. A Pakistan Navy officer Commander Murtaza briefed the audience regarding their contingency plan for relief activities. PN officer Agha Mumtaz said that operation Madad would be launched in case of floods in Sindh while an emergency response centre would be established at Coastal Headquarters to combat any emergency. Secretary Irrigation department shed a light on steps being taken to strengthen embankments along the rivers. He said that after 2010 floods, 76 schemes to strengthen embankments were launched and they had successfully completed 71 of them"
PDMA Sindh is organizing a One-Day Consultative Conference on Wednesday 11th June, 2014 to evaluate the state of preparedness and finalize a strategy aimed at minimizing losses with adequate preparedness and response measures in place. The Army Pre-Flood Conference held at Islamabad to review measure taken for flood preparedness. The conference attended by Mr. Akhlaque Ahmed Qureshi, Director Operation PDMA Sindh. Monsoon Contingency Planning Meeting with relevant departments held at PDMA head office to review monsoon preparedness status. Monsoon Contingency Planning Meeting with Karachi Division held at PDMA head office to review monsoon preparedness status. Monsoon Contingency Planning Meeting with Mirpurkhas Division held at PDMA head office to review monsoon preparedness status. Monsoon Contingency Planning Meeting with Hyderabad Division held at PDMA head office to review monsoon preparedness status. Monsoon Contingency Planning Meeting with Larkana Division held at PDMA head office to review monsoon preparedness status. Monsoon Contingency Planning Meeting with Sukkur Division held at PDMA head office to review monsoon preparedness status. The Provincial Disaster Management Authority (PDMA), Rehabilitation Department Government of Sindh with the collaboration of FPCCI organized a Multi Stakeholder Consultative Seminar on Rehabilitation plan for Drought affected areas of Thar on Monday 7th April 2011 at 10-00 am at Darbar Hall Deputy Commissioner Office Mithi. Elected representatives, Government Officers, Representatives of U.N Agencies, NGOs working in Thar and Media representative participated in the Seminar. Government representatives presented their development plans and UN agencies and NGOs also shared their projects and experience on different projects in the Rehabilitation plan, amended and recommended in the light of sustainability, integration and impact on the life of the people of Thar. On this occasion Mr. Taj Haider Coordinator to Chief Minister for Relief said that under the dynamic leadership of PPP and keen interest of the Chief Minister a critical phase of drought has been controlled and now we are working on effective rehabilitation of Thar through a sustainable rehabilitation plan. Commander (R) Syed Salman Shah, DG PDMA shared that we are continuously monitoring the situation of Tharparkar, there is a dire need to take long term mitigation measures to support the livelihood sources of people in Tharparkar. Poor economic condition of people is also a root cause of drought in Thar. 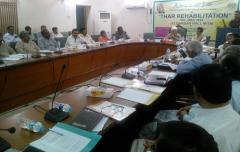 The Secretary Rehabilitation Mr. Roshan Ali Shaikh while delivering his key speech said, that we want to involve all stakeholders in planning, execution and implementation of development projects in Thar Rehabilitated Plan. Shaikh Mohammad Siddique the representative of FPCCI said we will make all possible help and technical support to the Government in carrying out welfare project which will be beneficial for Thar People. Second round with Multi-stakeholder Committee will be held on the 14th in Karachi in Federation House FPCCI on which will be presided over by Chief Minister Sindh. Earlier, Director General PDMA Sindh Syed Salman Shah has highlighted the efforts of Chief Minister Sindh in providing early support to PDMA, in regard to provide food item and other neceaaary/essential commodities of common people and allocated 484 Million. The Deputy Commissioner Tharparkar Mr. Asif lkram has said that with the early and timely support of Sindh Government, Federal Government and others we achieve the target to provide food stuff amongst drought victims in all over the district, and health facilities in 6 talukas, he further said that there is a need of comprehensive Development Plan Thar is needed. Besides other, MNA Faqeer Sher Mohammad Bilalani, MPA, Dr, Khatu Mal Jeewan, Secretary Livestock Choudhri Zafar, Ex-MPA Gianchand, DRM Specialist G.M Abro, Dr. Choudhry lnayat, Dr. Sono Khan khangharani, Hasar Foundation, SWFACO Arbab Nek Mohammad, Ali Akber Rahimoon, Mohammad Khan Mari and others representative of NGOs have delivered their speeches. 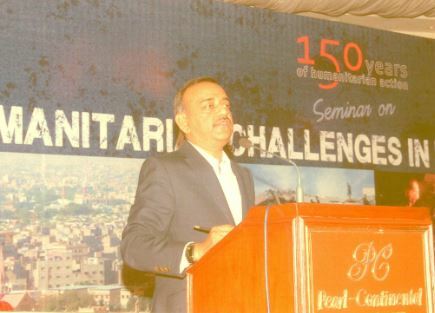 A seminar on “Humanitarian Challenges in Urban Disasters” organized by Pakistan Red Crescent Society (PRCS) Sindh with the support of International Committee of Red Cross (ICRC) in Pearl Continental Hotel Karachi. Mr. Shoaib Ahmed Siddiqui, Commissioner Karachi was the Chief Guest. The seminar addresses three key themes, the RESPONSE efforts to improve relief and recovery practice; the RESILIENCE building the capacity of a system, community or society potentially exposed to hazards to adapt; and the TRANSFORMATION fundamental change that results in the substantial reduction of a population’s vulnerability. This seminar invites humanitarian aid practitioners, those in government and designers from spatial/physical disciplines to explore ways to improve actions before and after disaster. Director operation Provincial Disaster Management Authority (PDMA) Sindh, Mr. Akhlaq Ahmed Qureshi said urban population is increasing day by day in Pakistan, especially in cities like Karachi, Lahore, Faisalabad and Islamabad, but no planning had been made to resolve issues emerging in cities with the increase of population. He said no mechanism had been introduced in the country to deal with urban disasters and its related challenges. He said there were different types of disasters, like environmental, natural and man-made. The Camp Office of PDMA Sindh, which is established at Tharparkar District Headquarter at Mithi is fully operational since the last 4 days and is in coordination with the District Administration Tharparkar for relief activities. Today, the Honorable Chief Minister (CM) Sindh Syed Qaim Ali Shah along with Director General, PDMA Sindh Commander (R) Syed Salman Shah and the Relief Committee and local selected representatives visited the different affected areas of Tharparkar district. A meeting was also held under the CM’s chairmanship in which all the concerned officers were also present. PDMA’s team, led by Director General PDMA, Sindh Commander (R) Syed Salman Shah and having two Directors and two Deputy Directors are in Tharparkar district to assess the drought situation and to ensure an effective distribution of the relief goods..